We’d love your help. Let us know what’s wrong with this preview of The World Savers by Matt Cowper. The all-new Elites have barely gotten to know each other before they're thrust into action. ...while they are far from united. Can this superhero team come together and save the day? Or will the team collapse in failure, just like their imme A legendary superteam reborn. To ask other readers questions about The World Savers, please sign up. Is this book a standalone at present, or is there a second book? If it is currently solo, is a followup planned? This originally appeared at The Irresponsible Reader. I also posted a Q&A with the Author today, if you wanted to check it out. There are going to be a lot of comparisons in this to Marvel/DC characters. This isn't saying Cowper's being derivative -- nor is he ripping any character off. These are well-known and established types -- he's not doing anything that Ben Edlund didn't do in The Tick, or Bendis in Powers, or Kirkman in Invincible -- etc. I'm just going to say something like "Slab is a Thing-like character" so I don't have to write three sentences to describe the Thing. Beverly Gillespie (an Amanda Waller-esque character), the Secretary for Superhuman Affairs, is re-assembling the legendary team, The Elites. Enough time has gone by since they disbanded (for very good reasons) that the government wants to start them up again -- under new leadership. Nightstriker -- a very Batman/CW's Arrow -type of guy. He's driven, he's obsessive, he's seemingly incorruptible, and doesn't play well with others and is pretty paranoid. Which is what attracts Waller -- she wants someone who'll go out of his way to keep the team's integrity. It takes some doing, but Nightstriker relents and selects a few people to join the new group -- none of them are the crème de la crème, Nightstriker considers them misfits, actually. But misfits that he thinks can work well together and be a strong Gestalt-y greater than the sum of its parts entity. No sooner have they assembled, than their home base, Z City, is under attack. I'll leave this vague, but essentially these opponents are Occupy Wall Street with a cult-like flavor, following a would-be world conqueror, with everyone within the group possessing some sort of metahuman abilities. So The Elites have to stop this group from destroying the city (or at least the financial and governmental structures), while learning to function as a team. The book is told through the points of view of Nightstriker and a member of his Elites, Blaze. Nightstriker's a strong take on the type -- you know him pretty well almost instantly.You get his motivation, his way of doing things and can understand his paranoia about reforming this team. He sees himself as not just Team Leader, but Mentor/Coach to his team -- but he has a lot to learn about being a Team Player as well as a Leader. Blaze is a high schooler struggling with Biology tests while he goes around fighting crime in a Human Torch-ish way (with shades of Firestorm, too). He's eager, he's naive, he's a little reckless, he has a sense of fun that's outweighed by a sense of responsibility. He's so wet behind the ears that it threatens to put out his fire. But he's smart (probably smarter than he realizes) and has nothing but potential. Nightstriker sees all of that (and probably more), and sees similar qualities in the other recruits. I really enjoyed his chapters -- the Nightstalker point of view is what the DC movies are (at their best), Blaze's are Marvel movies. The two together make a powerful combination. Metal Girl doesn't have point-of-view chapters, but we learn a lot about her -- her origin story, what makes her tick, etc. She's sort of a Vision/Red Tornado/Metamorpho cocktail. That description can only work once you've read the book -- it'll click when you do. I really dug her as a character and can't wait to see what Cowper has in store for her development. There are two members of The Elites that are under-served -- which isn't too much of a complaint, there's a lot of plates spinning in these pages and to try to fit in more of these two probably would be counter-productive. First is Buckshot -- think the Green Arrow or Hawkeye, but with guns (it's been too long since I've read anything with him in it, but maybe that makes him Arsenal-like) with a Western-motif about him and a talk-radio conservative world-view -- I like him, but think Cowper overplayed some of his characteristics (just a little bit). The other one is Slab -- he's a Thing-type character, who really isn't that much like Ben Grimm -- although they're similar. There's something about this guy -- as much as I enjoyed the rest of the cast, it wouldn't surprise me at all if Slab becomes the heart and soul of the team -- and maybe the guy who really comes through at the very end to land the coup de grâce in the finale. Maybe it's just me, but I like Slab enough that if you told me that Cowper was releasing a novella starring him today, you'd be reading my review about it tomorrow. There's plenty of solid super-hero action with a much larger cast of characters than you expect going in -- much larger than I've told you about, too. The best thing about the opponents of The Elites (I hesitate to call them villains -- although it's appropriate for at least some of them) is that there's some merit to their cause, enough that at least some of the super-heroes fighting them have to consider their actions. The world seems awfully black-and-white at the beginning, but by the end there's a lot of gray. This takes place in the same world as Cowper's Johnny Wagner, Godlike PI books, but it feels rather different. And it should -- one's a PI novel with super-hero overtones, the other's a straight-forward super-hero book. I enjoyed the first of those books (and really should've read the second by now), but Double Lives took awhile to win me over. The World Savers had me by the end of the first chapter. Don't ask me what the difference was, I couldn't tell you. But it's there. Great action, great characters (with room to develop and signs that they will), a world teeming with possibilities, this is a strong intro to a series that could turn out to be great (it could also turn out to be simply really good -- I'd be okay with that, too). This is a planned trilogy, and I'd pony up the cash for the next two installments right now if I could, I'm eager to see where Cowper takes these characters next (I have a small wish list, but I expect he has better plans). No question this is a superhero action story, but as much thought is devoted to character as to superpowered battles. Set in and above Z City, where superpowers are relatively common but only a few heroes have what it takes to move into the top-ranked S-Class, the most respected, most feared hero is Nightstriker—who has no powers at all. Through study and relentless training, he has made himself super. 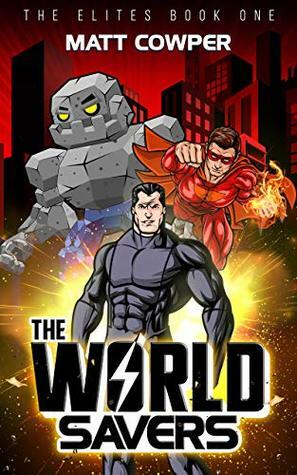 At the beginning of the book, the Secretary of Superhuman Affairs recruits Nightstriker to re- No question this is a superhero action story, but as much thought is devoted to character as to superpowered battles. Set in and above Z City, where superpowers are relatively common but only a few heroes have what it takes to move into the top-ranked S-Class, the most respected, most feared hero is Nightstriker—who has no powers at all. Through study and relentless training, he has made himself super. At the beginning of the book, the Secretary of Superhuman Affairs recruits Nightstriker to re-build the Elites, a superteam that fell apart when their leader betrayed them and everything they stood for. Nightstriker's first choice for his new team is Blaze, a teenager with fire powers who has been superheroing on his own since his mentor was killed but has no idea of his own potential. With the addition of three other misfits to the team, Nightstriker has to get over his solo habits and workaholic tendencies to become a truly inspiring leader, while his teammates have to learn to work together to enhance each one's strengths and counteract weaknesses. Point of view alternates chapter by chapter between Nightstriker and Blaze. Each has his own distinctive voice as well as strengths and weaknesses. Each also evokes other, more well-known comic book heroes, but these are not cheap copies. I enjoyed seeing the human in these superhumans as they overcame their pasts and developed new relationships and abilities. Where there are superheroes, there must be supervillains, and The World Savers has an intriguing one in the Giftgiver, a cult leader who can bestow superpowers on others but has no idea about training or team-building. Going with sheer numbers, he plans to remake the world into a utopia of egalitarianism...but at what cost? Fighting him presses the Elites to and beyond their limits while keeping this reader on the edge of her seat. And in case you're wondering, yes, this book is loaded with inventive superpowers and great code names, such as an ice-powered villain called The Antarctic Anarchist, the Elites' former leader Professor Perfection, and the rocky strongman Slab. Plenty of material for at least one sequel, and an ending that almost guarantees it. This was a great book. It was well written and planned out. The author has a vivid mind for this kind of book. I would recommend the book to anyone who loves Sci Fi. I know many people who would love it. I would surely give it to some of my fiends for Christmas. Very good and worth the time to read.